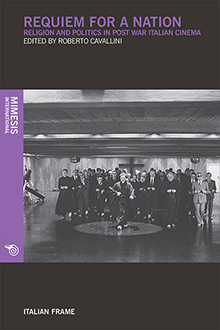 The primary objective of this collection is to examine the ways in which religion, culture and politics converge in configuring the contradictions of post-war Italy’s cultural history, starting from the assumption that conducting a critical reflection on Italian postwar visual culture requires investigating the inevitable impact of Catholic religion on everyday life in its social, political and cultural dimensions. The volume takes advantage of the privileged position of cinema to explore and critique religion’s influence on the Italian cultural landscape. This edited anthology thus seeks to probe how religion is experienced, practiced, criticized and represented from various methodological perspectives (historical, philological, aesthetic, psychoanalytical, popular studies, etc.) through four main sections: ‘Propaganda and Censorship’, ‘Framing Belief: Pasolini and Petri’, ‘Religion in Italian Popular Cinema’ and ‘Ancient Rituals, Modern Myths’. Roberto Cavallini is Assistant Professor in the Radio, TV and Cinema Department, Faculty of Communication at Yasar University, Izmir (Turkey). He was awarded of a PhD in Visual Culture in 2010 from Goldsmiths, University of London. He writes about Italian and European Cinema, documentary cinema and visual cultures. Contributors: Roberto Cavallini, Roberto Chiesi, Silvia Dibeltulo, Juan Juvé, Fernando Pagnoni, Laura Rascaroli, Daniele Rugo, Tomaso Subini, Daniela Treveri Gennari, Fabio Vighi.